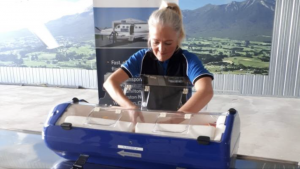 Thank you to The Taranaki Patriotic Trust for giving the Taranaki Air Ambulance Trust an amazing donation last year to ensure New Plymouth had a baby pod. Now with a top up donation, again from the Taranaki Patriotic Trust, we have been able to go one step further and provide South Taranaki with a baby pod as well. These are essential pieces of equipment in the care and survival of pre-term, sick babies and toddlers. Evelyn Kelly, a registered neonatal nurse at the TDHB with the new baby pod.